I‘m extra motivated this year to get my home in shape! Organization and cleaning will likely be at the top of many of our lists of things to manage better in the new year. I know I have a long way to go in getting my home organized! So to help inspire you (and me! ), I’ve published a new gallery archive of my related posts, this time on the topic of Homemaking! In the new gallery, you’ll find lots of great posts on organization, house cleaning and inspiring tips and ideas for your running your home. Click this link to find the new homemaking tips gallery page, then when you see the gallery page, just hover over the images to find topic titles and you can click to read! 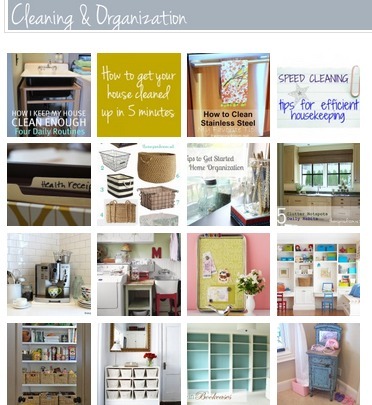 In addition to the homemaking gallery, there is a video player with awesome videos on organization right here! Happy New Year! I can’t wait to start 2013! I really like to organize for some reason so thanks so much for this post! Just what we all need this time of year…thanks! I’m looking forward to going through the gallery! I know you have awesome helpful tips! “How to get your house cleaned up in 5 minutes” is the first post I read here, and it won me over as a fan for life. :) I’ll definitely be working on cleaning & organizing this year, too. This is a dream of mine too! A home in which all things have their own place… and not piled in a junk drawer or ready-to-avalanche cabinet! Yay!! Hope you go to Haven! I’m really excited about it! Are you going to be speaking there? I looked for the schedule and said it is still being figured out. That’s great!! We’ll have to meet up!!! Can’t wait! Wow, I really need to follow your steps to acheiving an organized and beautiful home! I love the idea of everything having its own place and purpose. My ultimate goal is to live a minimalist life and hopefully this will be one of the steps to get there!